Any and all feedback is greatly appreciated. Many thanks to Alex who provided the correct line for the Intel Iris Plus chips. I’ve completed all the steps but it still doesn’t work for me 😦 When I try to start the game, the message “unknown error occurred” pops up. I just purchased a new macbookpro touchbar. The game used to work with my old macbookpro 2011. Now nothing works. I have all EP and SP and I followed all steps for all of them and still, nothing works. I get the same message of “unknown error occurred”. Which MBP 13″ or 15″? Read the links to the Unknown Error message in the drop down Sims 3 menu. Hi, it doesn’t work for me either. I have a Macbook Pro 13” w/ Touch Bar. I changed everything as in the guide, but nothing. I only have the base for now. BTW, I’m installing it from Origin because I don’t have the disks anymore. Please, I am desperate. I followed the steps and now my game runs on the lowest graphics and the options don’t save even if I change them. The device conflig log is blank, I reset it but it still doesn’t work. Please help, I followed all the steps, this game is killing me. I don’t want to reinstall all the EPs again, it takes like 6 hours. Your game works? Or doesn’t work? Are you trying to raise the graphics settings to medium once you’ve edited the files? My game loads and I can open my last save but for example the map view is all purple and blank. None of the settings save no matter where I slide them. The log is empty. Now I put the cgr files back to their previous settings and so far I only got one error and things got back to normal thank god! I was panicking. 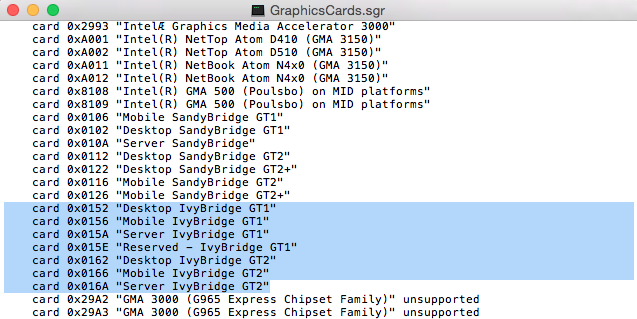 but the thing is: my mac’s graphic card is so much better than what I get and despite following your instructions for the Intel Iris Plus to the letter it still doesn’t recognise my cars and gives me crappy results. Is this because I run this game on a mac? Yes, the game has not been updated to support your Mac’s hardware or operating system. The last update was January 2014. Alright, I understand. Thank you so much for your help and quick reply. So is there a substitute card I could put in the cgr file instead of IvyBridge so that I at least get some better results? Or is this the best the game can do on a mac 2017? My biggest concern is that the buildings in all my towns, no matter if they’re fanmade or eaxian, are blurry and the details take a while to load while my sims travel the town. This lack of detail makes some custom towns unplayable for example, because the details of the town are beautiful but I can’t see them in the real time. I hope my description makes sense. Thank you for your patience. Perfect sense 🙂 the fix isn’t perfect but at least makes the game playable. You should be adding IntelIrisPlus into the .sgr file, not IvyBridge… unless you have a different Mac to one listed above? That’s the problem, changing the .sgr for IntelIrisPlus completely messed up my game (I couldn’t log in before, the user Malene is me). I changed the file exactly like in the instructions above, put my device ID 0x5926, edited both files. When I started the game it launched and I could load my save but the graphics were the lowest possible, the options reset and they didn’t save despite launching the game a couple of times and the file deviceconfig.log was always empty. The game was laggy and the town view was blank and purple. So I change it all back to IvyBridge so that I can at least play. Ok. I’m not sure why that would happen but it’s just trial and error I’m afraid. How about trying IntelIrisPlus640? It worked! IntelIrisPlus640 [Found: 1, Matched: 1] !!! Thank you! 🙂 Brilliant idea, I’m so ready for my new beautiful graphics! Everything seems to be sorted out. Do you think I should change the sgr files in all my EPs folders too? Or should I leave them alone? Great! And thanks for letting me know, all feedback is hugely appreciated and helps others too. I’ve added this info into the post 🙂 If your game works ok now I wouldn’t mess with the packs but if it’s still borked then yes, edit them. I have started the steps but when i get to the GraphicsCards.sgr file there is nothing on it its blank, Help me please! I did all of the steps, but when I load the game I can’t see some things. Like options show that they are there and highlight when I put my mouse over it, but I can’t see any words or images. Is there a fix for this? Not that anyone has reported back to me. When you’re on the actual lot and playing it should be ok though. Hi! I really appreciated all your information. However, mine is still not working. 😦 I still get ‘unknown error occurred’ when I tried to launch the game on Origin. My macbook is 2017 15″ MacBook Pro with Touch Bar. There are two graphics cards. Intel HD Graphics 530 & Radeon Pro 450. Could you help me? You don’t need to do anything to the .sgr files as the AMD cards don’t cause this issue. You need to read this and this. Have tried all steps and cannot get it to work, still comes up as “unknown error occurred” without launching the game. Anything else I can try ? You shouldn’t need to edit the files as the issue is mainly related to Intel chips. I have the 2017 15” MBP with AMD GPU and it works fine. Should ignore this and play as usual? thanks! Oh that’s interesting – thanks! Just to confirm that your Mac is the 13″ MacBook Pro, not the 15″ with dual graphics? My bad – should have included more specs to begin with. I just purchased the 2018 Mac Book Pro 15″ 2.6 GHz Intel Core i7 Intel UHD Graphics 630 1536 MB. Under system report > Graphics I see Intel UHD Graphics 630 and Radeon Pro 560X. Sorry, idk if this is all the info you need to understand what I am talking about. Thanks, that makes more sense. That error only ever comes up on machines with AMD GPUs, which are only in 15″ MBPs, not 13″. You should be fine to play, for now. Hi, No idea how to find my device ID. I have an early 2015 Mac Book Pro 13 inch with retina display. I don’t know what to replace “0x0000” with at all. I’ve searched all over. Not even sure where I’d find what’s supposed to go there. About This Mac doesn’t have anything similar. You need to read the whole article. At the top you’ll see it’s a 2 part article, read the first part…..
Hi there! I found this post after trying to troubleshoot getting the Sims Medieval to launch on my 2017 MacBook Pro. First, an apology – I’m asking about a different game, and I’m using a computer model not listed here, so I understand that the information here probably isn’t applicable, and it’s maybe foolish that I’m trying and selfish that I’m asking! But as you seem like such a reliable source, I wanted to ask just in case. I have a late 2017 MacBook Pro, with 4 Thunderbolt ports; the Model Identifier is MacBookPro14,2. When I try to launch the Sims Medieval in Origin, it fails to launch with an error code “service initialization failed 0x0175dcbb”. (I originally tried installing both Medieval and the Pirates + Nobles EP, but I got a similar message, so I tried uninstalling P&N and now am trying to load just the base game and that’s the error I get.) I looked at the EA forums and other Mac users have had the same issue, so I tried to follow the steps recommended, but couldn’t complete them either – there’s a step that requires disabling GateKeeper, but that’s no longer an action available on later MacBook Pros. First, I tried resetting Origin and uninstalling/reinstalling/repairing the game, but it didn’t work as I kept getting the same error message. Then I read on the EA forums that addressing the graphics card issue may be a workaround, so I ended up here, but since my MacBook model isn’t listed and since this guide is for the Sims 3 and not Sims Medieval, I got stuck on the first step as there’s no IvyBridge lines in the GraphicsCard.sgr file for the game. Is there another section of code I should try replacing? Or any other information I could provide? Thanks so much either way – I’m blown away by your dedication to this kind of troubleshooting, and that you still respond to comments on these pages months and even years after they were started!